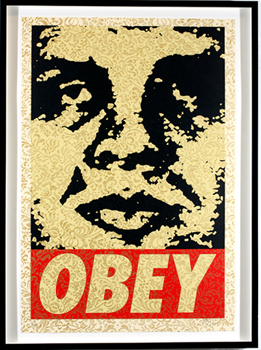 This image (originally used in the 1995 print Griny Obey) is one of four large-format prints made to commemorate the release of Shepard’s book, Supply and Demand. Each print depicts an evolution of Shepard’s design and form, from 1989, 1995, 1999, and 2004. The Gallery Editions of the Retro Series prints were an edition of 10, though at least one AP and PP are known to exist, and feature deckled edges and a metallic gold pattern printed atop the main silkscreened image.